Shop your heart out in every season, as Settlers Green in North Conway is the ultimate destination for finding all the best deals on the brands you love. With over 60 national brand name outlets and specialty stores to peruse, get all of your shopping done, and get it all tax-free. 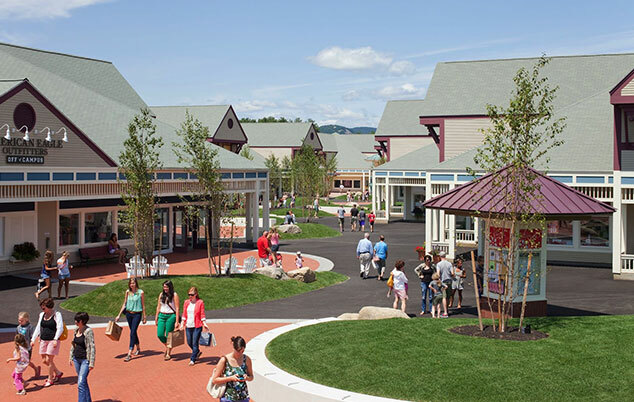 This New England shopper's paradise includes Settlers Green Outlet Village and Settlers Green Streetside, where you will find outlets like GAP, Coach Factory, Banana Republic Factory, Under Armour Factory, Nike Factory, J. Crew Factory, as well as plenty of restaurants and eateries to keep fueled up. Hop over to Settlers Corner and Settlers Crossing for additional stores and restaurants under a mile away. Check out the special events throughout the year happening at Settlers Green including the popular Girlfriends Weekend in the fall and stay with us at Grand Summit Hotel at Attitash, just 12 miles away. Monday to Saturday: 9 am to 9 pm, Sunday: 10 am to 6 pm, Holiday hours vary. What stores are in Settlers Green? Settlers Green offers all the brand name outlets you’ll go wild about at 30-60% off, plus tax-free. Bargain shop ‘til your heart’s content at stores like Coach Factory, Gap Outlet, Banana Republic Factory Store, Adidas, Carter’s, J. Crew Factory, Old Navy Outlet, The Children’s Place, Tommy Hilfiger, and dozens more. If that’s not enough, stroll over to the Streetside shops just across the street and find additional stores and restaurants like Barley & Salt Tap House and Black Cap Grille. Where is Settlers Green located? Settlers Green is located in North Conway, New Hampshire, situated in the White Mountains surrounded by views of Mt. Washington Valley, the highest peak in the northeast. Just 12 miles from the Grand Summit Hotel at Attitash, Settlers Green is right on Route 16, with a GPS location to 2 Common Court, North Conway, NH 03860 or use Latitude: 44.024026, Longitude: -71.109673. There is plenty of parking, free Wi-Fi, picnic spots, restaurants, and a lot of brand name outlets to visit.